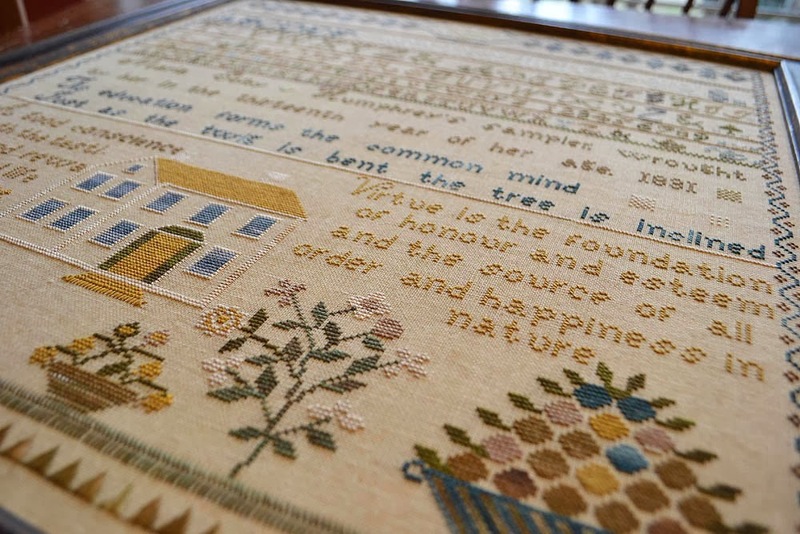 Barb designed "The Country Life," and it was the Loose Feather pattern for Jan. I love all of the animals in the yard. When my kids were home for Christmas they saw a pair of foxes in our hedgerow. I think I might have to stitch this one! It should be in the shops now. My Friend's House is at the printers now. It's the pattern for Feb. and will be at the distributors soon. I have to show some pictures sent to me by Theresa Venette of Shakespeare's Peddler. I stitched this for my friend, Jennifer, for Christmas this year. I thought you might like to see it! :) On one of the pictures, you can see my pliers -- I had just finished framing it! 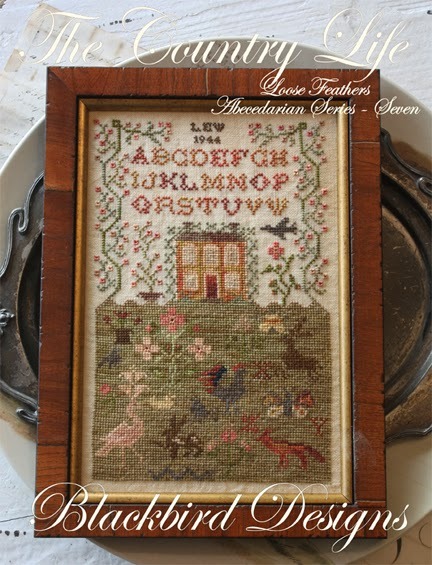 I stitched it on a 30 count R&R Reproductions hand-dyed linen with the Sampler Threads. Jennifer is a professor of Anatomy and Physiology, so I really liked that there was a quote on there about education. She was tickled pink to get it. Many thanks Theresa for sending your pictures. What a lucky friend!!! 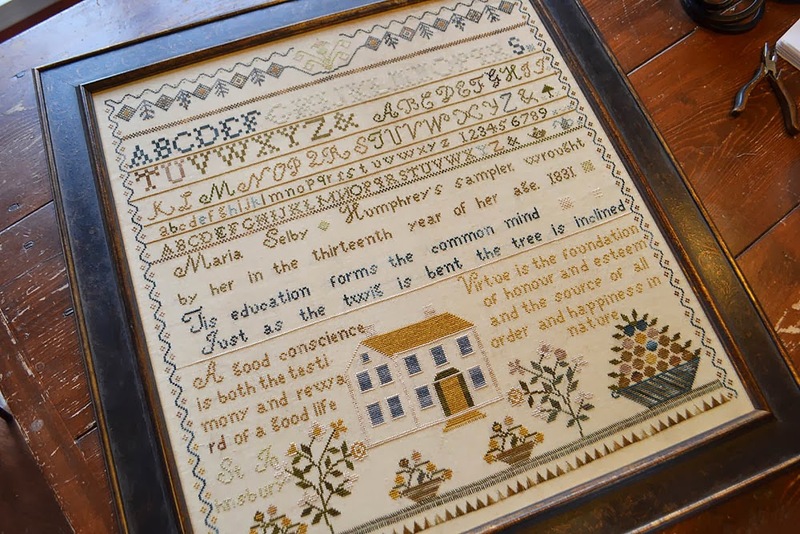 This sampler is from our booklet Maria Selby Humphrey - 1831. Moda Blog Hop begins Feb. 17th. This one will be fun. Look for details soon! What beautiful pieces! I'm just starting back cross stitching after years away from it. I retired and now I get to do what I want and cross stitch is one of them. Although I feel I need to take a class in it as I've forgotten how to do it all. Are there any books you could recommend to learn the proper way. 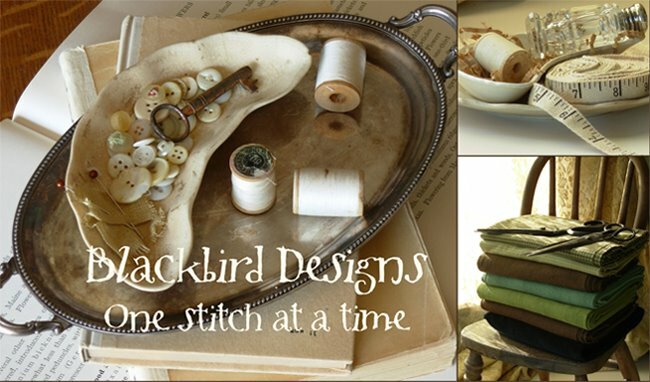 I'd like to stitch all those projects you pictured. They're all gorgeous! I am in total love with the January piece! Love the February one too. This series has been so beautiful to me! We are getting the snow and ice tomorrow. Fingers crossed we keep our power! Good to hear from you, Alma. I really like the latest Loose Feathers, especially the one with the big front yard. So far behind in my stitching. Stay warm and safe. We're supposed to get 6-12" overnight!! friends House chart for sure, love it and I have a friend who will be moving into her new home this spring so it will make a great house warming gift. Perfect timing. 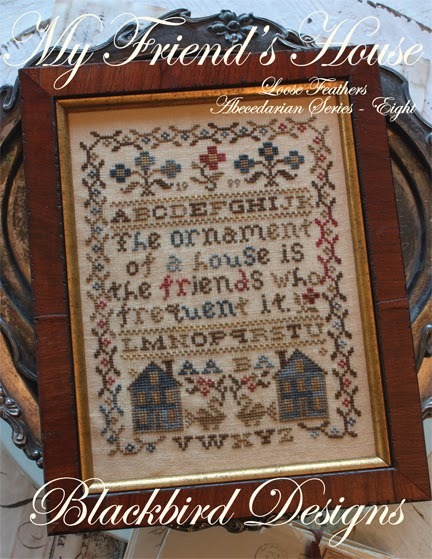 I'm looking forward to My Friend's House coming out as I'm itching to stitch a sampler. Thank you for a lovely blog and stay safe and snug. Beautiful, beautiful! Love My Friend's House, must get it when it comes out. I have sure missed you posting - looking forward also to some quilting news. Just beautiful work .....your talent overflows might have to do both of them having a hard time deciding on one! Gorgeous, as usual!! I love to see the soft use of colour in your designs. First, I just love your designs. I have stitched several and have lots of patterns in my stash. I am the lucky Jennifer that received that beautiful sampler stitched by Theresa. I was so overwhelmed by her kindness. Thank you for designing such a pretty piece. 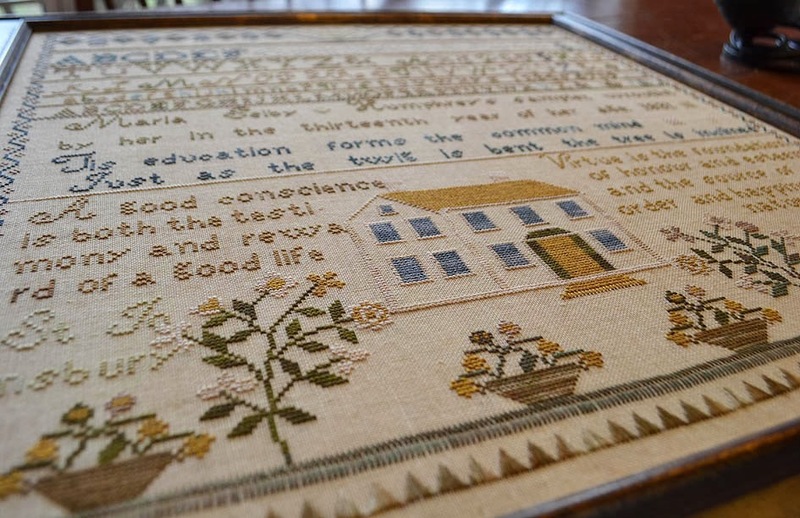 Well, your friend Jennifer must have been absolutely delighted with this charming sampler... is is soooOooo lovely, beautiful workmanship (can you say workmanship, shouldn't it be workwomanship???) well done you, many thanks for letting us have a peek at it! What happened to the blog hop?? I am having a difficult time with V & Co. there is so much advertising on that site that my computer freezes and I cannot print the letter V .....please pass along. From Diane H.
Love the plum fabrics and it will make a beautiful alphabet quilt. Looking forward to making this quilt. If I were the lucky winner, I would make a banner for my daughter's jewelry shop (show tent) to spell out her shop name. She also graduated from TCU, so the colors are more than perfect! Love your quilts and fabrics! I've made 3 so far! quilt. Thanks for the chance to win. With talented designers like yourself, I can choose fabrics bundles that make my quilts turn out just beautiful. Thanks for the inspiration.